to mark the months and years? Let's check this out, since we are at the beginning of the year, just one week into the month of January. In ancient times, people began to read time by using the natural cycles, the lunar cycles, to mark days and months and the solar cycles to mark years. It is the ancient Egyptians who are responsible for creating the first calendar comprising 12 months. Each month consisted of 30 days. But, later in order to synchronise (agree in time) at least to some extent, with the solar year, they adding five more days to the end of the year. The Greek rulers of Egypt, under Ptolemy and the concept of a leap year, added a day every four years, and the Romans who later ruled Egypt, reinforced (strengthened with new support) this concept. The early Roman calendar was very different to the present day calendar, even though there were 12 months. Could you believe that then the year began from March? January fell towards autumn due to numerous alterations that were being made by corrupt high priests in charge of the early calendar. In the event they wanted a certain official to continue in office for a longer period than the stipulated (specified) time, the calendar was lengthened to keep that person in office. When it came to some person the high priests wanted to get rid of, the calendar was shortened to end the 'enemy's tenure' (length of time in office). 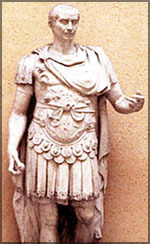 The new Julian calendar was established by the Roman Emperor Julius Caesar. It went into effect on the first day of January 709 AUC (ab urbe condita) from the founding of the city (Rome) in January 1, 45 BC. The Julian calendar then became the predominant calendar for the next 1600 years, until Pope Gregory made further reforms in 1582. In the early Roman calendar, the twelve months alternated evenly between 30 and 31 days (except February), which made August 30 days. 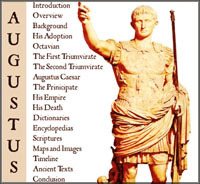 However, as August was named after Augustus Caesar and the month of July (named after Julius Ceasar) had 31 days, the number of days in August too was altered by the Roman senate to 31 days. This was done by making certain changes. One was that a day was taken off February, which originally had 29 days (30 in a leap year) thus making February 28 days (29 in a leap year). But then, once August became 31 days, there were three consecutive (unbroken) months having 31 days - July, August and September. This needed to be altered so, it was decided to have 30 days in September, April, June and November.Most of the names of months in the present day calendar are derived from Roman deities and from Roman numericals. Only two months are named in honour of Roman Emperors. The time between full moons is 29.53 days. There are 365 days, 5 hours, 48 minutes and 46 seconds in a year (365.242199 days). Russia used the Julian calendar till 1917, China till 1949. The eastern Orthodox church adheres to the Julian calendar to date. The 'Christian Calendar' is a term traditionally used to designate the calendar commonly in use. It has years of 365 days or 366 days, divided into 12 months that have no connection to the motion of the moon. Two main versions of this calendar have existed in recent times, the Julian calendar and the Gregorian calendar (1582). The Julian calendar was in common use until the 1500s when countries started changing to the Gregorian calendar. The Julian calendar has one leap year every four years. However, the four year rule was not observed in the first years after the introduction of the calendar in 45 BCE. Instead, every third year was a leap year due to a calculating error. According to the Roman calendar which was in use before the Julian calendar was introduced, the year began on March 1 and consisted of only 304 days or 10 months. This month, which now marks the beginning of the year, was dedicated by the Romans to a two-faced god named Janus - the God of beginnings and endings. It was called Januarious in early times. It was originally the eleventh month in the year. As Janus, the two faced god, with a face in front and another at the rear, could look back into the old year and forward into the new, making January the first month of the year seems appropriate. Originally, it was the Roman month of purification prior to the new year (March), from the Latin februo meaning 'I purify by sacrifice.' It could also be named after the Italian god Februus. The third month in the present day calendar which was the opening month of the year in the early Roman calendar is believed to be named after the Roman god of war - Mars. Remember, there is also a planet called Mars. The name of the fourth month of the year is derived from the Latin word aperire meaning 'to open', the time of fertility, when Mother Earth was supposed to open up for plants to grow. It was known as Aprilis. There are many theories about the name for the third month of the early Roman calendar. One is that it may have been named after the Roman goddess of growth and increase, Mala (mother of Mercury) or after Maiesta, a Roman goddess. Then it is also said that it could have been derived from the Latin word Majores, meaning elders. The fourth month of the early Roman calendar, June may be dedicated to Juno, the Queen of Heaven. It could also be derived from the clan name Junius based on the Latin word juvenis or junioves meaning young men, as the previous month (May) is dedicated to the elders. As Emperor Julius Caesar was instrumental (a means) in reforming the Roman calendar, this month was named after him by Mark Anthony in 44 BCE, the year he was assassinated. It was also called Quintilis or fifth month. Until the end of the 18th century, July was pronounced to rhyme with truly. However, Julius Caesar celebrated only one July because after it was named for him he was murdered, on the Ides of March. Caesar, because it was his lucky month. Several fortunate events had occurred in this month; thrice he entered the city in triumph and also brought Egypt under Roman authority in this month. It was the seventh month in the early Roman calendar and derived its name from Septem (seven). When Julius Caesar reformed the calendar it was made the ninth month. Even though it was renamed several times, none of the new names lasted long. Originally the eighth month, derived from the Latin word octo (eight) it was held sacred to Mars. The name has its origins in the latin word novem (nine). Having changed July and August to commemorate great Romans, the Senate had offered to name this month after Tiberius Caesar, but he had declined. It was also derived from the Latin word for number ten - decem, like most other months in the calendar we follow today.